BRIAN NORTON: Hi, my name is Brian Norton, Director of Assistive Technology at Easter Seals Crossroads, and this is your Assistive Technology Update. JOSH ANDERSON: Hello and welcome to your Assistive Technology Update, a weekly dose of information that keeps you up-to-date on the latest developments in the field of technology designed to assist individuals with disabilities and special needs. I’m your host, Josh Anderson, with the INDATA Project at Easter Seals Crossroads in beautiful, yet cold, Indianapolis, Indiana. 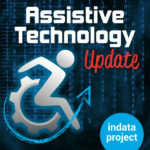 Welcome to episode 402 of Assistive Technology Update. It’s scheduled to be released on February 8, 2019. On today’s show, we are very excited to have Brian Norton on to talk about the AT mobile unit that we are going to be having at Easter Seals Crossroads. We have a new Amy from BridgingApps on to talk about an app worth mentioning. We’ve got a follow-up to the scooter story from last week. And we also have a little bit of information from the ATIA conference that I just returned from and some of the new Google accessible auto that’s going to be available for android. I am just fresh back from the ATIA conference in Orlando, which spoiled me a little bit with the weather and also just getting to be around so many amazing folks. All kinds of new technology, all kinds of great ideas, and it’s really nice to get to be around a lot of folks who, again, use the intelligent gifts they were given to try to make the world better for all people. It was a very good conference. I feel like I learned a lot. One thing that I always seem to get from the conference whenever I go is getting back to basics, thinking about the things we do all the time, and sometimes taking a step back that we don’t always need the newest things, but maybe using things that are already there in all new ways. There was all kinds of great assistive technology, some new stuff to help out on anything from works to ADLs to anything, people using built-ins in all new ways, people using other technology in all new ways. It’s really hard to describe it all at once. My real goal is to have a lot of the folks I met there on the show here in the upcoming weeks and months, and hopefully we will have those on. I don’t want to talk about everything that I saw there — we will talk about a few things. But if you want to hear some of the coolest stuff that we did see, myself, Brian Norton, and Belva Smith will discuss those on an upcoming episode of ATFAQ. I believe that will come out on Monday. If you listen to the podcast also, that was going to cover some of the neat things that we saw, and some other things you hear about on that ATFAQ will actually end up being interviews here on the show as well. So if you want to learn a little bit more about those, which are to tune in and listen to the show so you can hear about those a little bit more in depth. Also, don’t forget that if you have information on something new in assistive technology, you can also reach out to us and let us know. We would always love to hear from our listeners and we always need more ideas and great things to interview. I know I’ve got some emails waiting right now from some folks and things I saw at ATIA that I want to try to get on the show. Again, if you’ve seen some things, maybe you’re really interested in something, be sure to reach out to us and we can try to get those folks on the show. Also, if you have questions about assistive technology, don’t forget to reach out to our sister show, ATFAQ. I also need to apologize to everyone this week. I am having a bit of a cold, so if my voice sounds nasally or weird, or weirder than usual, I do apologize. But we are going to make it through and get interviewed done in the show up and running. One thing that in the last few years has really amazed me about ATIA and some of the presenters are these huge companies, Microsoft, Google, Apple, are showing off some of their new accessibility features, things they are either building in or making available for download, or new apps to make their devices more accessible to folks. I sat in on a training from Google, in its for a couple of new options they have for android users to help folks who are deaf or hard of hearing. I will put a link in the show notes over to Google’s blog as well if you want to read more about it, was a video about it. But there are two different things. One of them is live transcribed. Live transcribe, if you think — this is in YouTube I believe already. If you are doing YouTube live, I think you can have the live transcription show up. But they are actually putting that in the android system. If you think, it’s kind of like a CART service. What it would do is give you live transcriptions of speech. The transcriptions come up as a white print on a black background, kind of how it starts out. You can always change some of those. Really, it’s just a real life captioning. If I either have severe or profound hearing loss, it would really help out because when talking to folks, I can have everything they say show up right on my screen. It’s using artificial intelligence. Of course, there are some other apps that can do these kinds of things. This one is made to work on the android system. It’s actually going to be in the accessibility settings, so you don’t have to download anything. It’ll be available in over 70 languages and dialects, so very cool. It will be really neat. It says it’s going to be preinstalled on all Pixel 3 devices in a limited beta right now that you can get on the play store. It has some of that information. The other thing they are going to be putting in is what’s called sound amplifiers. I believe you actually have to go to the play store to get this. Sound amplifier, if you think — and I have this issue. If I’m trying to really listen to someone and I’m in a noisy environment, I have a really hard time focusing. For me, it’s more that I’m listening to what everybody is saying, it gets a little bit overwhelming. But for a lot of folks, they can’t differentiate the sound. Especially if you were sitting in a group and the person is a little bit further away, maybe you can hear the person right next to you, but the person across the table is very hard to hear because the background noise. That can happen anywhere that we are these days, especially if people are talking on their phones around and everything else. So they made sound amplifier. This works on android smart phone. You need wired headphones. What it does is it filters, arguments, and amplifies the sounds in the environment. It increases the quiet sounds while not over boosting the loud sounds. Essentially it helps you listen to what you actually want to hear without making just everything a lot louder. It’s got very simple sliders, so you can reduce unwanted sounds, sound reduction intensity. Behind the scenes, this is doing a lot of stuff, a lot of equalizers, a lot of sounds getting changed. But the actual user interface is very easy. It says right now, sound amplifier is available on the play store, support android 9 Pie or later phones, and will come preinstalled on the Pixel 3. So a lot of these they are actually building into their own phones, which makes sense. But you can always bring those on and use them on other the ones. So it used to be there’s all kinds of hearing devices you could use for this, personal sound amplifiers, other things like that. But this is going to be on a device that you already have. The other thing I saw in the presentation was that they are also going to make it to where their android phones work with a lot more hearing aids, so different ones with Bluetooth compatibility, so folks can use their cell phone as a booster and have the information go right to their headphones. I will put a link over to Google’s blog just so you can learn a little bit more about these new programs that they are doing to help the deaf and hearing impaired using android phones. Check our show notes. For many years now, BridgingApps, out of the Easter Seals of greater Houston, has been nice enough to contribute to this show with apps worth mentioning. For most of that time, Amy Barry has been on here, telling you about different apps that can help individuals with disabilities, where to find them, and a small review of those apps. We’ve always appreciated Amy helping us out with those. But today, you are going to notice something different. You are still going to have the great apps, the great reviews, and all that, but we have a whole new Amy. That’s right, Amy Fuchs will be taking over today in the App’s Worth Mentioning segment from BridgingApps. We are very excited to have her on here. Take it away, Amy. AMY FUCHS: This is Amy Fuchs with BridgingApps, in this is an app worth mentioning. This week’s featured app is called Voxer Walkie-talkie Messenger. Voxer Walkie-talkie Messenger is a walkie-talkie app for mobile devices. You can chat with your friends by sending real-time voice misuses, texts, videos, and pictures. The messages are delivered so quickly that you will forget you are actually not on a phone call with the person. Voxer is great for group conversations to make plans, solve problems, and share information. Voxer is also great for people who have difficulty typing due to fine motor or vision issues, those are who are not strong spellers, and even for those who are not yet strong readers. The app is very simple to use. To send a voice message, just choose the friend you want to send it to, and hold the orange icon that looks like a walkie-talkie. Then start talking. You can even send pictures or videos from your phone’s camera as well as graphics interchange format, known as GIF’s, attachments using the paperclip icons, or your current location. You can turn on notifications to get instant messages, or if you need to silence it for a while, turn off notifications and your messages will be waiting when you’re ready to listen to them. You can listen to your messages in three different ways: through your phone, holding it to your ear; speakerphone; or with headphones or other Bluetooth devices. It is a truly versatile app with many customizable settings. Voxer may benefit users with difficulty typing, spelling, or reading, also those with visual impairments, since it can be used exclusively with voice messages if the user chooses. Voxer is available for free at the iTunes Store and Google play store and is compatible with iOS and android devices. For more information on this app and others like it covers the BridgingApps that work. JOSH ANDERSON: I’ve got kind of a quick update to a story we did last week. Last week, we did a story on the lime and the different scooters that people are using in different towns in order to get around. They are very good, inexpensive, just ways for people to travel, especially those who do not have cars. But we talked about some of the issues that they bring up on individuals with disabilities. People may be leaving them in the wrong areas, leaving them in curb cuts, in front of doorways and sidewalks. They are very quiet. May be coming up on someone with a hearing impairment, them that knowing they are there, hitting them, those kinds of things. We talked about how it’s just common sense, just be a good person, be nice, don’t leave your things. I came across a news story, kind of a bit of an update. This one is out of Nashville, news Channel 5 in Nashville. It’s written by Kelsey Gibbs. I’ll put a link to this in the show notes. It actually talks about how they are going to look at legislation to make docking stations for these. Essentially you would put it up and put it back on these docking stations. It would be at a location. I could see how this would be very helpful. If I’m driving this to work, I would have to find one of these docking station to pick it up and find one close to my work in order to put it, so I could see some issues coming up. But apparently I’m not the only one who talked about this, if they are trying to look for legislation for it. So just an update on that. If you are a user of those scooters, very cool, but at the same time just remember other folks and take them into consideration. I’ll put a link in that report to our show notes. Our guest today has been on the show many times for a number of reasons, with most of them being good. He’s the popular host of our sister show, ATFAQ, the head of our tech act project here in Indiana, the director of assistive technology at Easter Seals Crossroads, my very gracious, patient, and kind boss, and a very good dancer. But today he is on the show to talk about a new program we will be heading up here at Easter Seals Crossroads that we are all very excited about. Brian, welcome to the show. BRIAN NORTON: Thanks Josh. Nice to be here. JOSH ANDERSON: It’s great to be sitting in the driver’s seat. Usually when we are on ATFAQ got you are over here. BRIAN NORTON: I know. I like this role I have today, a little bit — I don’t have to be running the board. JOSH ANDERSON: You don’t have to do any of the editing. For folks who don’t know you or about you, can you give them a background information of yourself and your role here at Easter Seals Crossroads? BRIAN NORTON: Sure. I started here at Easter Seals Crossroads 22 years ago, straight out of college. I started in our employment division as an employment consultant, helping folks get jobs, specifically folks with disabilities, working and resume writing skills, job skills, interview skills, those kinds of things. A couple of years after that, I was approached by folks in our AT department, which at that point was really getting started. I’ve been here ever since, so I’ve grown up with the program, grown up with assistive technology over the years. As you mentioned earlier, my roles here, I oversee the INDATA project, which is Indiana’s assistive technology act. All 56 states and territories have an assistive technology act where we provide education about assistive technology, making sure people are aware of assistive technology, and also helping people get their hands on it, so the acquisition of assistive technology. We do that in a variety of ways. I also oversee you and your team day-to-day, the clinical team, where we work with folks one on one, providing wraparound services for them, only for assessment but also training, install, and follow along with them. I do the ATFAQ show, and that’s a really fun time each week that we get together and talk about questions that come in from all over the world. It’s super fun. JOSH ANDERSON: Very cool. It’s funny, Brian, road kind of came the same way. Later, not 20 years ago. I’m too young for that. I also started in the employment division and moved up here. Now there is a new rule where we are not allowed to go to the employment division because they are afraid we will steal away employees. BRIAN NORTON: It is true. We have found the folks who are brought up and nurtured in our employment program make great assistive technology specialists. JOSH ANDERSON: You do, because there is so much crossover. JOSH ANDERSON: That’s not what we are here to talk about today. JOSH ANDERSON: Brian is throwing his notes away. That’s all he had. Today I really want to tell our listeners about an exciting new grant that the firm has received. First of all, just tell us what the name of the grant is and how it works. BRIAN NORTON: I grant is called Assistive Technology Mobile Unit, so ATMU, grant. This grant is through the Christopher and Dana Reed foundation. They have something called the High Impact Innovative Assistive Technology grants that are awarded specifically to assistive technology act projects. One of those 56 project I mentioned. Each project, they come up with their own, what they want to do with that money that comes through the grant. What we chose to do is to try to expand some of what we do within our loan library. We wanted to make sure that in our loan library, where folks can come in and borrow things for a period of time, or receive demonstrations of different types of assistive technology, we wanted to make sure that we had a really robust lineup of equipment for folks with spinal cord injuries or mobility impairments. We were able to purchase a vehicle which allows us to bring equipment directly to individuals and fill it full of specifically assistive technology devices that address the needs of folks with mobility impairments or spinal cord injuries. JOSH ANDERSON: Who can actually utilize this program? BRIAN NORTON: It’s open to just about anybody. You don’t have to be a person with a disability, but you can also be a provider, a family member, really just any interested party can come in and take a look at what we have, receive a demo on some of the equipment, and then borrow it for 30 days. What I love about our loan program is it’s as if going to the library — everybody goes to the library, and they check out a book. You borrow that book for a period of time. That’s what our loan library is. It’s technology, but it’s the same premise. You can come in, borrow it, and take it back and when you are done. It helps you make a better informed decision on purchasing and works really well for folks. JOSH ANDERSON: What’s different about this program is they don’t have to come here. We can go to them? BRIAN NORTON: That’s the biggest thing about this. We want to go out and visit folks in their home. With that mobile unit, we now have event equipped with the technology. It is stored in the van. What we need to go meet with folks, we can do that. It helps eliminate a lot of that stress that folks have. It’s a lot of cost in time traveling for individuals, specifically that have spinal cord injuries or their attendants or family members who is driving them around. Take all that stress away. We are going to come to you, meet you where you’re at. It could be anywhere and provide that service to you. JOSH ANDERSON: What are some of the items that are available? Some of the items that would be in the van? If you came out and did a demonstration for me, what are some other things I could expect to see? BRIAN NORTON: Devices in our unit can cover a wide range of needs. You can think about basic feeding, grooming, self-care items, so aids for daily living. Also things for home automation technologies. JOSH ANDERSON: Okay, so a lot of IoT stuff? BRIAN NORTON: IoT, making sure that you can access your environment. You need to turn on and off the lights, you can operate just about anything that has an on/off switch that is electronic in nature. Home automation stuff, computer access solutions for socialization, employment, education, things like notetaking systems, positioning equipment. Really, there is a ton of equipment. JOSH ANDERSON: No kidding, just about anything to cover independence. I kind of skipped over it, we talked about all 56 states and territories. At first, I thought you said 56 states. I missed the extras. BRIAN NORTON: I always feel weird with that statement. I say 56, and they’re just thinking this guy is crazy. It’s territories as well. JOSH ANDERSON: I’m going to have to buy a new flag. Highwood folks find out about their local tech act? They may not have the mobile unit, but if someone in Wisconsin or California would want to know where they can go to borrow stuff, how do they find that out? BRIAN NORTON: We have an easy way to find out who your local assistive technology act is. If you go to EasterSealsTech.com, you can put a forward slash on the end of that URL, and it will take you to a landing page where you can choose which state you are in and it will bring up the information and contact information for who your local AT act is. That’s EasterSealsTech.com/states. JOSH ANDERSON: You touched on this a little bit, but why do you think this program is important? BRIAN NORTON: I’ve been doing this for a long time. One of the things that is hard about the job that we do, but also has the potential to really inform decisions that folks are making — if we can go out and meet with folks and have the technology with us — we’ve seen a lot of different things. We know a lot of the different types of devices. Really, for a person to have their own vested interests, they’ve had the chance to be able to touch it, feel it, and experience it in their own environment, I think that’s a vitally important in the assessment process that they get the opportunity. Then we get their buy-in and know that they like it. I’ve been doing this for a long time. Personal preference rules but they a lot of times with assistive technology. You can recommend the most functional piece of equipment, but if they don’t like it, then they are not going to use it and it’s going to collect dust in the closet. This gives people the opportunity to experience the technology before we make the decision and then, conversely, once we make that decision, it’s something we know they are going to use because they like it, it’s really going to make the difference for them because they’ve touched it and have been able to feel it and experience it. JOSH ANDERSON: I have to agree, that’s something that’s always amazing. At least once a week, I get to meet somebody and tell them something. They are like, wow, I had no idea that was out there. I didn’t know that could do that. I was tell them, there are podcasts out there you could be listening to that could tell you all this stuff. At the same time, being able to go to them and take that many items is very helpful. I know a lot of times grants and things like that have goals. Is there a certain goal for this program, a certain amount of people you want to touch or anything like that? BRIAN NORTON: I think our goal is all about awareness. We want to make sure people are aware of technology. We want to come out and do demos. We want to meet with 100 folks throughout the first year. We are working on that goal and getting closer to it. That’s the purpose of it, or our goal related to it. We want to be out and meet people, share this equipment with them. We are looking at the number of demonstration we can provide within the year as the overall goal with that project. JOSH ANDERSON: I know you’ve been out and been able to talk to some folks that have used the program. Can you tell me some stories about some folks that have been helped by this program? BRIAN NORTON: We’ve done a couple of news stories with some individuals. We had a lady who was in the workplace. She had a full-time job, was doing lots of really cool things just in everyday life. One day, she fell down the steps and broke her neck in four different places. I believe it’s a C5-C6 spinal cord injury, so she did have some movement in her arms, some gross motor movements and those kinds of things. Before her, the challenge was she’s looking for a new job. She needs to know about the technologies that are out there for computer access. She was an office manager in the past. She just needed to experience some of that and have that available to her. We were able to come out and meet with her in the home. We put down lots of different technologies as far as voice input technology, different types of keyboards cut different types of mice. I worked with her to find some solutions that worked for her. And interviews she gave, it was so nice to not have to come someplace and travel to someplace. We were able to go to her home and meet with her there. Really, is that knowledge base. There is lots of different technologies out there, but if you don’t know about it, you don’t know about it. We were able to come in and talk with her, better understand her situation, and put some things down in front of her that maybe she hadn’t thought of before and could prove to be life changing for her as far as the productivity and efficiency with which she can work, even despite her impairment. JOSH ANDERSON: Very cool. I know transportation is always a big challenge for almost all the folks we work with. In Indiana, while not the largest state that can be a pretty large state. Being able to come to them can make a big difference. If folks want to find out a little bit more about this program or more about you, where would they go to find the information? BRIAN NORTON: To find out more about the services we offer through the INDATA project and this grant, we would have you go to our website EasterSealsTech.com. Or if you’re interested specifically about loan library and our demo program, I would have you give us a call at 888-466-1314.You can either talk to me or Justin Amber. He is our loan library specialist and coordinate a lot of those loans and set up those visits and demonstrations. You would also be able to chime in on some of that. JOSH ANDERSON: I really love the program and love that we have it in house. Think you so much for coming on the show to talk to us about it today. BRIAN NORTON: Thanks Josh. This was fun. It’s fun to connect over 80 update and not just ATFAQ. You are doing a great job. I love what you’ve done with the show. JOSH ANDERSON: After you said that, we will have you on again. I promise. Thanks again.